Hide deals from seller "Theori Stages Presents: Wendell Tucker Hates the World sponsored by Cold Steel Vodka"
Hide deals from category "Theater & Plays"
Limit 1 per person. 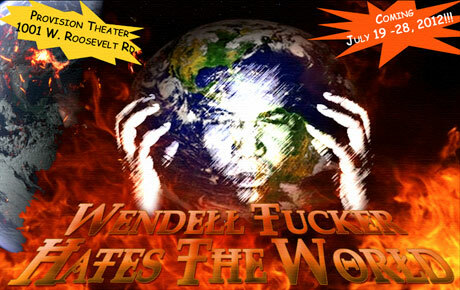 Valid on 2 tickets to “Wendell Tucker Hates the World.” Show runs from July 19 to July 28, 2012. All show times are 7 p.m. Must be 18 or older to redeem. Must be 21 or older to win Cold Steel Vodka prize. Promotional value expires July 28, 2012. Enjoy a night of thought-provoking humor with 50% off two tickets to “Wendell Tucker Hates the World,” presented by Theori Stages ($30 value). This 1-man comedy show runs from July 19 to July 28 at the Provision Theater in Chicago’s University Village. Acclaimed playwright Wendell Tucker stars in this unique play that draws upon his experiences as an African American man recently diagnosed with major depressive disorder. Through his hilariously angry musings, Tucker urges minorities to fight for their mental well-being. Tucker also addresses everything from love and technology to the customer service industry and the American health care system. Audience members will also have the opportunity to win a collectible bottle of Cold Steel Premium Vodka signed by founder Chris Lenahan. A 1-man show about the experiences of an African American male diagnosed with major depressive disorder.